Hadassah doctors at work at Ayder Referral Hospital’s operating room. Straightening Mebrete Gembramichel’s misshapen back would have been a challenge for Hadassah surgeons even at their home base in Jerusalem. But the Hadassah Medical Organization’s spine team wasn’t working in its sophisticated underground operating suites, where there’s a well-stocked blood bank and a pair of robots who help surgeons flawlessly align vertebrae. Rather, on a sunny day in March, these Hadassah doctors, nurses and technicians were in Ayder Referral Hospital in Mekelle, Ethiopia—capital city of Tigray Province—in the northeast section of a country where most families live without electricity and running water. Despite the challenges, the 12-member Hadassah medical team was poised to carry out the complex spine surgery to correct acute scoliosis. This was the first such spine surgery ever in this country with a population of 100 million. Part of a pilot orthopedic mission, Mebrete’s surgery was also the first of five that the team completed while in Ethiopia. In preparation for the procedure, Drs. Leon Kaplan and Josh Schroeder examined X-rays of the 16-year-old’s back to plan their surgical strategy. Over the winter, her spinal curvature had become even more severe, going from a 45-degree to a 75-degree curve. Her lungs were already compromised; without intervention, she was likely to catch pneumonia, often fatal in Ethiopia due to malnutrition and limited medical resources. While the two orthopedic surgeons finalized their plan, Hadassah nurse Ruven Gelfond transformed the Ayder operating room with the aid of a crew of Israelis and Ethiopians. Gelfond is the most experienced member of the Hadassah team at field missions. Chief orthopedic operating room nurse at Hadassah Hospital on Mount Scopus, he has played a leading role in Israel’s governmental outreach missions to Haiti, the Philippines and, more recently, the Israel Defense Forces’ operation at Israel’s northern border that treated Syrians wounded in that country’s civil war. Gelfond issued detailed, clear orders: The floors needed to be swabbed, the walls wiped down and the local equipment—X-ray machines, tables and IV poles—required disinfecting. Tall steel canisters of oxygen were rolled in, and the operating table was fitted with a spine support. Immense boxes of orthopedic screws and rods were hauled in and opened. Donated by Medtronic Sofamor Danek, an American medical supply company with an R&D office in Israel, the treasure chest of supplies was sent to Ethiopia with the help of Israel’s Ministry of Foreign Affairs. Next came the pièce de résistance: an intraoperative nerve-monitoring computer system that allowed Hadassah neurophysiologist Sagi Gudes to monitor brain signals during a surgery that gets close to the delicate nerves of the spinal cord. Hadassah nurse Orna Tadoses-Solomon with Mebrete Gembramichel. The rest of the surgical team arrived wearing their usual green Hadassah scrubs, and then Mebrete was brought in. 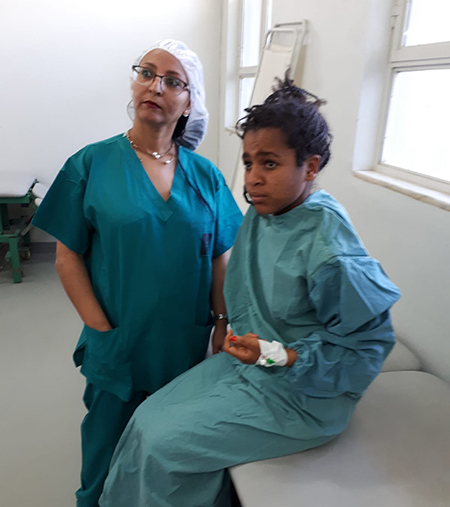 She had come to the hospital with her older, married sister, with whom she had been living in Mekelle as she sought medical care. Her mother and father were hundreds of miles away in their remote farming village that has no phone service. They wouldn’t know the results of their daughter’s surgery for days after the procedure. Ultimately, a relative who owns a cellphone trekked to their home by donkey to relay the news. 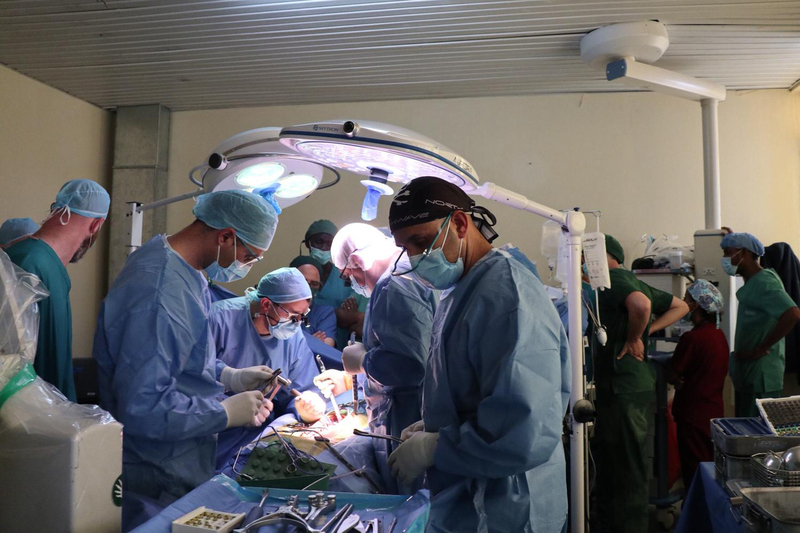 Ethiopian doctors, nurses and technicians stood nearby, observing as Dr. Yuval Meroz, senior anesthesiologist at Hadassah, and resident Dr. Galel Yakobi put Mebrete to sleep. Dr. Meroz has a reputation for being unflappable; as part of his IDF reserve duty, he accompanies the medevac helicopters that pick up wounded soldiers under fire. Working from opposite sides of the table, layer by layer, the surgeons exposed the twisted spinal cord. Choosing the angle at which to reposition the vertebrae, Drs. Kaplan and Schroeder placed the screws one at a time. Their brows became wet with perspiration as they worked, and they sipped water through a tube pushed under their masks. At each step, there was feedback from Gudes, stationed at the computer monitor, assuring the surgeons that they weren’t damaging the spine. The two surgeons are used to working in tandem; such teamwork dramatically shortens the length of a surgery, preventing blood loss and promoting better overall results. That’s true in any Western medical center, and even more so in Ethiopia, where access to 21st-century medical resources are scant. All was going well, despite Mebrete’s underperforming lung. Suddenly a power outage brought all the machines, including the ventilator, to a halt. Dr. Meroz switched to a manual airway pump, filling Mebrete’s lungs with oxygen. The surgeons waited a few long minutes until the electricity came back on, and then got back to work. Five hours after the procedure began, the surgeons closed Mebrete’s back and began to wake her. Outside the operating room, the air was fragrant with the smells of the coffee and popcorn the Ethiopian staff served to celebrate the successful surgery. But in the recovery room, Tadoses-Solomon’s work was just beginning. The Ethiopian nurses watched, puzzled, as Tadoses-Solomon took charge, moving with quiet efficiency. She gave orders to the staff and then gently tucked her patient into a special warming sheet brought from Israel. “How do you speak Amharic so well?” asked one Ethiopian nurse who said her English name is Helen. The nurse tried to define what was so incongruous about the Ethiopian-Israeli. It was her body language, Helen finally said. Tadoses-Solomon walked and talked assertively, easily taking charge and always making eye contact, something Ethiopian women rarely do. The Ethiopians were fascinated and inspired. Tadoses-Solomon laughed, explaining to them that she was born in Ethiopia. “I guess my Ethiopian breeding has been impacted by sabra chutzpah,” she surmised. The following morning, Tadoses-Solomon monitored Mebrete as she got out of bed and stood ruler straight. The young girl was two inches taller. “You are angels who came from Jerusalem to save me,” Mebrete told her with a teary hug. Over a four-day period, the Hadassah team successfully operated on five Ethiopian teens. Each case was complex, including boys and girls with kyphosis (hunchback), needing theracoplasty (rib removal) as well as others with acute scoliosis. Indeed, Hadassah has a long relationship with hospitals in Ethiopia, which began with HIV/AIDS work. Dr. Allon Moses, director of clinical microbiology and infectious diseases at Hadassah, has worked extensively with medical centers in Ethiopia; he recommended Mekelle for the pilot orthopedic mission. “Ayder has a university and medical school where the Hadassah specialists could also give a day of teaching,” he said. In late 2017, he traveled with Dr. Schroeder and Gelfond to meet potential patients and check the viability of performing surgery there. “I saw the need,” said Dr. Schroeder. He nevertheless was relying on Gelfond’s vast experience with medical care in the developing world to decide if the mission would be successful. “Ruven came back and said, ‘Leon, we can do it,’ so I knew it would work,” said Dr. Kaplan, head of the spine surgery unit. “I immediately volunteered to go, too.” They received speedy approval from Dr. Meir “Iri” Liebergall, head of orthopedic surgery, and the blessings of HMO Director-General Dr. Ze’ev Rotstein. Private and commercial donors paid for the flights; HMO gave the medical professionals the time off, and the doctors and nurses all volunteered to participate. “It was easy to find Hadassah colleagues who wanted to volunteer to take part, despite the difficult conditions,” said Dr. Schroeder, who lives in the city of Modi’in and sometimes gives a lift home to Tadoses-Solomon, who lives nearby. When she heard about the mission, she also volunteered. For two decades, the Hadassah Medical Organization has led pioneering work on HIV/AIDS treatment in Ethiopia. HIV/AIDS is a major health crisis in parts of Africa, and a number of Ethiopians who immigrated to Israel in the 1980s and 1990s arrived infected. Hadassah opened an AIDS clinic in 1985 in its clinical microbiology and infectious diseases department. Department head Dr. Shlomo Maayan developed the clinic into the Hadassah AIDS Center, known for its unique multidisciplinary approach to patient treatment. In addition to a cocktail of retroviral drugs, he understood that disease management must include ongoing emotional and psychosocial support from nurses, social workers and psychologists to address the disease’s stigma within the family and community. Hadassah also hired Ethiopian immigrants to serve as mediators, assisting the center with language and with cultural gulfs that could affect compliance with treatment. The United States Centers for Disease Control and Prevention, involved in funding programs to reduce the spread of AIDS in Africa, recommended Hadassah’s multidisciplinary approach as best-suited to Ethiopia. Between 2005 and 2011, the United States President’s Emergency Plan for AIDS Relief brought 150 Ethiopian medical professionals to Hadassah for courses and, through the Israel Consortium on AIDS Medicine in Africa, Hadassah professionals visited Ethiopia to treat patients and teach doctors and lab technicians. Under President George W. Bush, American funding enabled a partnership between Hadassah and Ethiopian clinics that included the distribution of medicines. On a 2005 trip to Ethiopia, Dr. Dan Engelhard, head of Hadassah’s pediatrics department, was invited to the Mother Teresa Missionaries of Charity Orphanage in Asko, a suburb of Ethiopia’s capital, Addis Ababa, where 400 children were infected and dying without medical care. Dr. Engelhard arranged for retroviral drugs to be administered and trained the local doctor and resident nuns, using Hadassah’s multidisciplinary approach in a program called ART (antiviral therapy), JOY & LOVE. In one year, mortality rate dropped to 1 percent at the orphanage. Thirteen years later, Dr. Engelhard and a team of volunteers still service four orphanages in Ethiopia under the Hadassah program. Barbara Sofer is a veteran journalist and author as well as Israel director of public relations for Hadassah. She lives in Jerusalem.